About a year ago, we decided to pick up a compost bin from our local dump. To cut down on garbage waste going to the facility, they offered a very nicely designed large unit for about $30. Despite using it for almost a year religiously, it is still only about half full. We have yet to tap it for our compost just yet. When you generate food waste, you have the option in some cases of pouring it down the drain (garbage disposal), throwing it in your trash or composting it. If you have access to a town or city sewer system, dumping your food waste down the drain may seem quite appealing. Certainly, it is simple. But if you have a septic system, then you know this is not a great idea. It isn’t a great idea if you have city or town plumbing either. The cost of processing the waste, the potential damage it does to our environment and the burden it places on society all make it a rather thoughtless and selfish act. Throwing it in the garbage tends to have nastier consequences. It draws flies, the waste that builds up needs to be picked up by your garbage pick-up service, and once in the dump, it can draw vermin, birds and animals to the site. Another consideration, if you are a gardener or have other need for compost, is that it is an incredible waste. Your biodegradable waste can form compost which can be used in your garden or yard and is extremely rich in plant nutrients. We do recommend, however, especially if you have a smaller yard and don’t live in the country on a multi-acre lot, that you definitely use a composting bin or barrel that can be closed. You can make your own, but do it. Otherwise, the pile will attract some animals and pests you didn’t plan on. 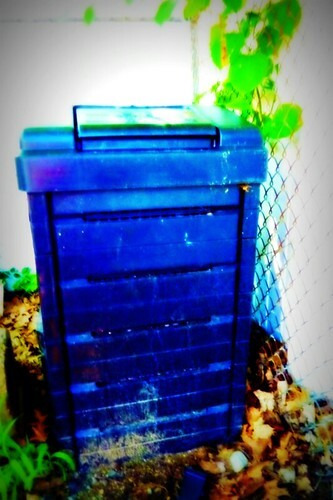 Inevitably, though, pests are drawn to compost bins and heaps. Such flies and other annoyances are best kept distant. You should keep your composter at least 50 feet to 100 feet from your house. If you choose to use a compost heap instead, you should keep at least 100 to 200 yards away from your house. Also, never keep the heap in your garden. It is tempting, seeing as that is where most of your compost will go, but it draws garden variety pests as well seeking an easy meal. My father liked to keep his compost pile in the garden and consequently had frequent troubles with moles, woodchucks and the like drawn by the available food source, and then they would additionally discover a smorgasbord all around of fresh garden vegetables as well. Just like at the zoo, the best motto is, “Don’t feed the animals”. Our experience with the composter has been quite interesting. We have had it in place for about a year, and despite pouring all of our food waste into it (no animal waste, bones, pits or solid items) it remains about half full for the past six months. Natures creatures are munching on our waste and creating a very rich black compost. It is a gradual process, especially here in New England, where winter stalls the process, but it delivers rich compost. Other than the obvious result, it did something else we did not expect. The composter surprise is that it draws flies away from your home. We keep our composter about 100 feet or so from our back door. We cannot smell it from even 10 feet away. But the flies can. During summer time we were always plagued by fruit flies when our fruit was a bit ripe. A ripe banana or other fruit would draw them like, well, flies. We did not like to have fruit in the house during the summer primarily because of this. This was especially true of bananas, which we could not refrigerate. Since utilizing the compost bin, we have not seen a single fruit fly in the house and have fewer house flies. The odor draws them away from the house. We now have fruit at the ready available to eat all summer long, and the flies are happy helping us generate compost rather than annoying us in our kitchen. All around, the composter is a great idea. It is ecologically friendly, cutting back discarded waste. We get compost from it, obviously. And it draws flies and insects away from our home. You should definitely get one, even if you never thought of it before. As your waste disappears into usable compost, you are doing yourself and your environment a huge favor. Anyway, your blog not only looks great but you have great content as well.